An epic YA fantasy for fans of Stealing Snow and Snow White and the Huntsman. Set in the mystical Far East, this reimagining of The Evil Queen legend is about one peasant girl's quest to become Empress--and the darkness she must unleash to achieve her destiny. Eighteen-year-old Xifeng (pronounced She-fung) is beautiful. The stars say she is destined for greatness, that she is meant to be Empress of Feng Lu. But only if she embraces the darkness within her. Growing up as a peasant in a forgotten village on the edge of the map, Xifeng longs to fulfill the destiny promised to her by her cruel aunt, the witch Guma, who has read the cards and seen glimmers of Xifeng's majestic future. But is the price of greatness too high? To claim her place beside the Emperor, Xifeng must cast aside Wei, the young man who has longed to marry her since childhood. And darker still, she will have to embrace the callous magic that runs through her veins--magic fueled by eating the hearts of the recently killed--for the god who has sent her on this journey will not be satisfied until his power is complete. 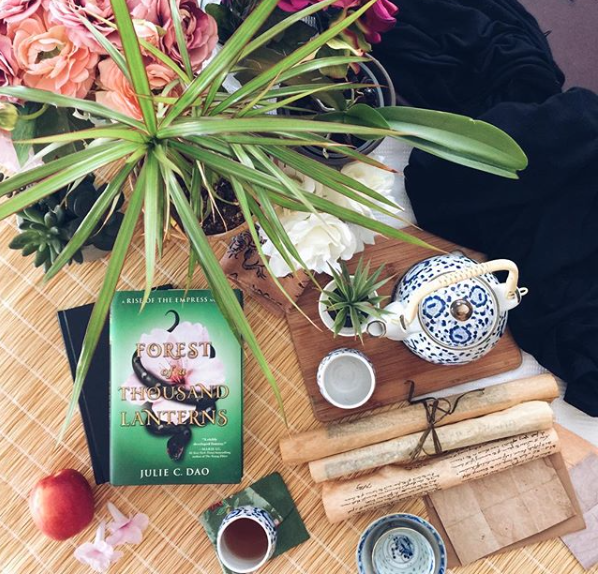 Set in an East Asian-inspired fantasy world filled with both breathtaking pain and beauty, FOREST OF A THOUSAND LANTERNS possesses all the hallmarks of masterful fantasy--dazzling magic, heartbreaking romance, and a world that hangs in the balance. Author Bio: Julie Dao is a proud Vietnamese-American who was born in upstate New York, and then was raised amidst the autumn fields and sloping mountains of New England. She went to college to become a doctor, but (go figure) came out ready to pursue her passion of creative writing. She is greatly influenced by the work of Jane Austen, J.K. Rowling, Maggie Stiefvater, Jhumpa Lahiri, Neil Gaiman, and Laini Taylor. Julie lives in New England. Anti-Hero(ine): a protagonist who lacks conventional heroic qualities such as idealism, courage, or morality. Although antiheroes may sometimes do the "right thing", it is often for the "wrong reasons" and because it serves their self-interest rather than being driven by moral convictions. . I love a good villain, but I’m usually drawn to the hero(ines) if it comes down to preference. However, I’ve lately been reading more and more books with protagonists with anti-hero personalities and it’s made for really intriguing reading. 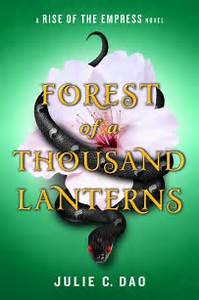 “A Forest of a Thousand Lanterns” was such an interesting take on the origin story of Snow White’s Evil Queen, and it was a journey that both satisfied my vengeful side, but also left me a little uneasy. . I just read “Girls Made of Glass and Snow” and thought that was the best Snow White retelling I’d read so far, but this lovely was equally awesome and much much darker. .
My favorite retellings are the ones that don’t mimic the original tales closely. I love seeing the creativity in some of these authors as they pull important and key details from the original tales and rework them to fit into their story with clever twists. Overall, in Forest of a Thousand Lanterns, I ultimately knew where it was going and what was in store for some of the characters, but that’s expected with a retelling. What I loved was the world building, the setting, the background story created for Xifeng, and the uncomfortable and dark underlying current to the whole thing. I loved the clever way key original components of the story were woven into the story with new faces. . I think Julia Dao did a brilliant and stand out job with this one. This year I’ve read some retellings that are setting a high standard for me and what I’ll consider a great retelling in the future, and this was one of them. If you’re a fan of chinese culture, Snow White, and the fun that comes with making connections between the new and the old, I very much recommend this one! Click HERE to enter to win all nine books on the Wicked Reads blog tour!